I've not posted much, but I've still been baking, and I think my re-engagement with this site has encouraged me to try a few new things. 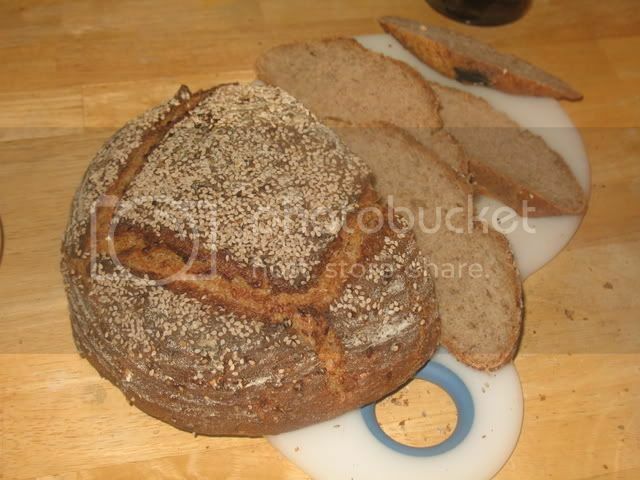 Most recently, I made a variant of Jeffrey Hammelman's excellent Flaxseed Bread, which contains 60% rye. I've altered his recipe a bit, using whole rye instead of medium rye, increasing the hydration to 80% (to account for the extra absorbtion of whole rye) and used a rye starter at 100%, simply because that's how I keep mine. The recipe may be found in the handbook here. 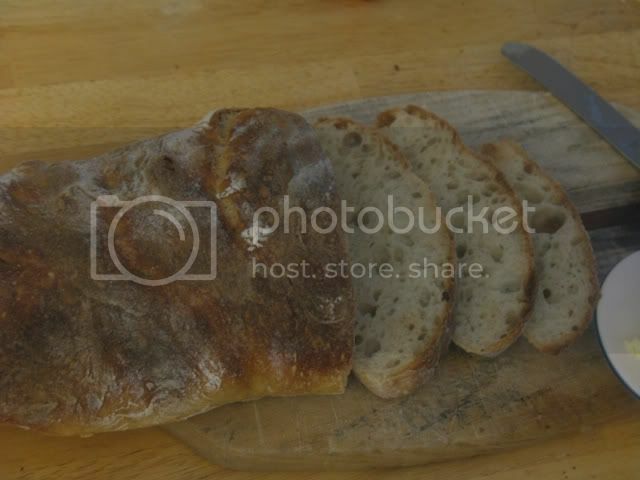 Usually, I just let the sourdough do its thing, and don't add any commercial yeast. But, I was under some time pressure here, so I went ahead and added 3/4 tsp of instant yeast like Hammelman. Wow! I couldn't tell any difference in flavor, which was hearty with a good tang, but I got quite a bit more volume. As for the rise, Hammelman calls for 80 degrees. Well, it was about 64 in my house, so I just threw a cup of boiling water in the bottom of a cooler, stood the dough on an upturned bowl and closed it up. The bulk rise took about 45 minutes and the final rise was just over an hour (I intended to go just one hour, but got stuck on a conference call, as I work from home -- augggggh!). Here's a picture. As you can see, I sprinkled sesame seeds on the top right after shaping. Earlier in the week, I decided to give the Sullivan Street Potato Pizza from Glazer's Artisan Baking Across America a shot. You think you've worked with a wet dough? Trust me, until you've made the dough for the crust in this recipe, you've not worked with wet dough. The hydration on this puppy is something like 104%! It's a batter, and since I don't own a stand mixer (the recipe says to leave it in the mixer for 20 minutes) I went the food processor route, a la Peter Reinhart, and let it churn away for 45 seconds. Did it work? I've no idea. But the dough (if you want to call it that) was smooth, and I was able to spread it over the pan. 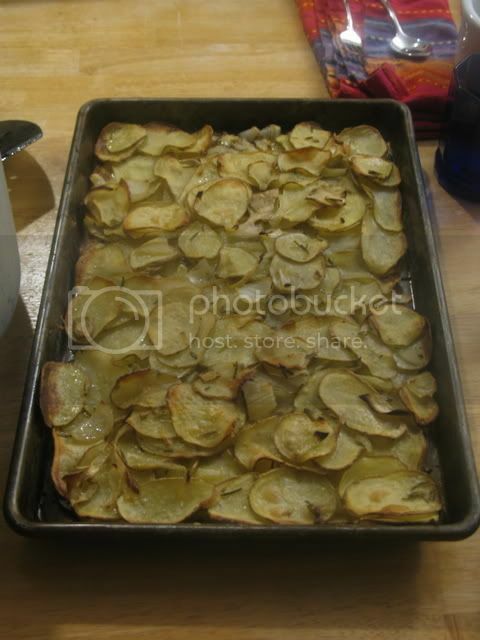 It was a good potato pizza, but a little too starchy for my taste what with bread and potatoes together. Not sure I'll make it again. I also decided to give Ponsford's Ciabatta from this same book another go, which has previously given me fits. As usual, probably because my house is so cold (below 60 at night sometimes) it took about 36 hours instead of 24 for the biga to develop. But this time around, I actually got a decent loaf of bread. Truth be told, though, I thought the poolish ciabattas I've made before tasted better. I don't see much advantage in using so little yeast (1/4 tsp of yeast is disolved into a cup of water -- then 1/2 tsp of that water is used to leaven the biga!) for the home baker, though I can see how it would be a big advantage for a professional baker to be able to let it ripen 24 hours. Finally, I made a couple of Colombia batards, also from Glazer's book. MountainDog turned me on to this bread, for which I'm very grateful. Clearly, as bulbous as these loaves are, I should have let them proof another 30-60 minutes, but odd-looking bread for dinner is better than day-old bread the next day (well, most of the time). They tasted lovely, as always. And the innerds, which, had I waited another 45 minutes, would have likely been more open. But, alas, the soup would have had no accompaniment. I love the flaxseed recipe too! Lots of flavor and a generous sprinkling of flaxseeds throughout the crumb make it really appealing! I also usually add a speck of fresh yeast to the rye breads in Hamelman, as I'm using the 1-step Detmold build for the sourdough. Since rye isn't very "tolerable" towards extended fermentations, I think it's a good idea. They all look great as usual. The potato pizza looks like a challenge. I have read that whole flax seed has no nutritional value because they don't digest. Ground on the other hand are great added nutritional value. As the master of whole grain breads that you are, do you have a thought on this? I've heard the same thing, and have also heard that, once ground, flaxseeds lose their nutritional value very, very quickly indeed. Like, within a matter of hours. Peter Reinhart was once asked this question, and his reply was that, since the flaxseeds are soaked overnight, they're digestible. Myself, I have no idea. They certainly do soften a lot with the soaker -- it's neat actually. The soaker turns into a sort of flaxseed jelly. Tastes delicious in the bread though! I've ground up flaxseeds and put them in bread before, and it adds a very, very strong flavor to the loaf. Whole, the flavor is more subtle. 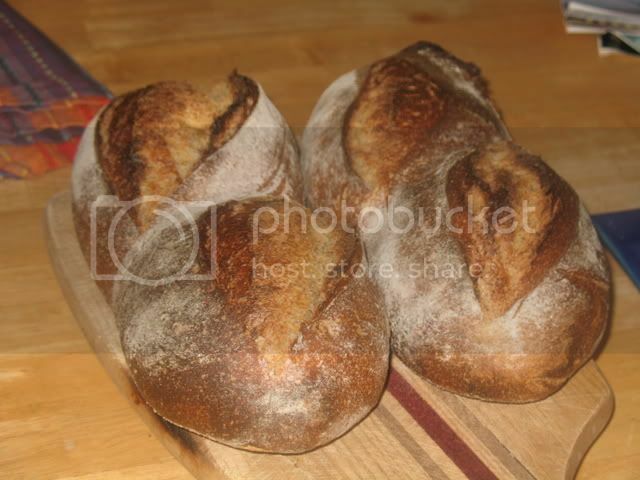 Love those batards! I have yet to invest on the Glazer book, so I have no idea what went into the recipe. The crumb appears to be of a softer texture than most artisanal bread. Am I right? My preference is for a thin crispy crust with a soft crumb, rather like those that are called Italian bread at most bakeries. So long as you use AP flour, bake on a stone and steam the oven, you should get a crispy crust and a soft crumb with any lean bread you make, meaning a bread with just water, salt, flour and leaven. Personally, I like KAF Organic Artisan Flour, which is about 11.3 percent protein, and Guisto's Baker's Choice, which is between 11 and 11.5% protein. 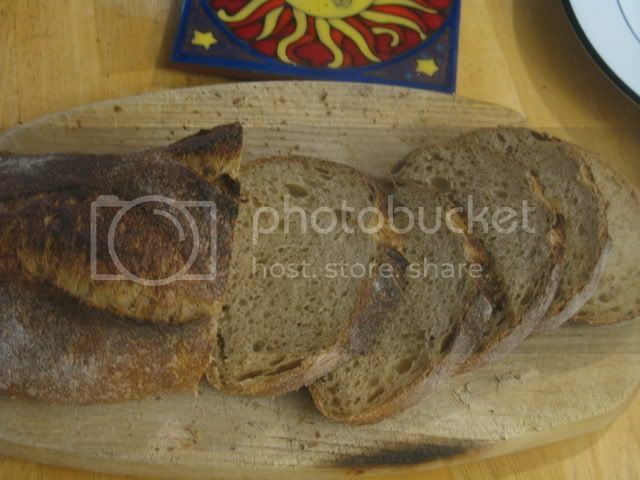 The Colombias also contain a small amount of malt syrup and toasted wheat germ, but not enough to affect the crust, beyond giving it a somewhat darker color than other sourdoughs. I've ground up flaxseeds and put them in bread before, and it adds a very, very strong flavor to the loaf. Can you describe the flavor, JM? Good? Lousy? I've been thinking of doing the same thing but my only experience with flaxseed is using them with a mix of sesame and sunflower seeds. Your description of the flax jelly is right on. I'm about to shape a batch and the way the transformed overnight was interesting. I tasted a few seeds and they definitely have something going on.